After flying in from Ireland the previous day and then staying out fairly late, we decided to forego the planned Open-Top Bus Tour and snooze for an extra hour or two. We ate breakfast in our room, then caught the Tube to Green Park Station, arriving about 10:00 a.m. We approached Buckingham Palace through Green Park and had plenty of time to look around before staking out a spot with a view on the steps of the Victoria Memorial. It became quite crowded by 11:00 a.m. and we were glad we had arrived early. [Several spectators climbed onto the low walls surrounding the monument, but were made to get down, so while that may seem like a fabulous perch, sitting on the wall is not permitted.) After the ceremony, the crowd dispersed fairly quickly and we walked from Buckingham Palace through St. James’s Park where we stopped to eat ice cream and hang out with the pigeons. From there we walked to Trafalgar Square and on toward the Thames. As we ascended the Golden Jubilee pedestrian bridge, we got our first glimpse of Big Ben off to the right. From the bridge we had an excellent view of the London Eye, Big Ben, Parliament, Whitehall Court, and the wide Thames River. On the opposite side, we meandered along the South Bank, a hub for London’s arts and entertainment crowd. We boarded a Thames sightseeing boat next to the London Eye and cruised up to the Tower of London, getting an up-close view of Tower Bridge in the process. [I recommend purchasing tickets for the Tower online ahead of time, though they are available onsite and in other locations around London.] We had to decide whether to head straight for the crown jewels or take the Beefeater tour. We opted for the tour, which leaves the entrance gate every thirty minutes. Our Beefeater (Yeomen Warder) tour guide was super personable—witty and very informative. The tour lasts about half an hour and then you are free to look around on your own. We went inside Beauchamp Tower, but saw everything else from the outside. The line to see the crown jewels was incredibly long, so we opted to skip that and cover more territory. We hopped on the Tube in time to return to our hotel, change clothes, and take a cab to The Ritz Hotel for Afternoon Tea (even though it was actually evening by then.) I had heard that the British cabbies are quite chatty, but that was not the case with ours. A quick fifteen-minute ride got us from South Kensington to the Ritz in plenty of time for our 7:30 p.m. tea time. Afterward, we caught a cab back to the hotel and got some seriously needed sleep! By Day 3, we felt like old hands at navigating the Tube, traveling from South Kensington to St. Paul’s and even changing lines—an accomplishment for two small-town, greenhorns! Again, I had purchased advanced tickets online so we were able to go right in without waiting in line. No photographs are allowed inside, which is always disappointing. You can opt for a guided tour or choose to use an audioguide; both are included in the admission charge. After completing the audio tour we made the climb all the way to the top of the dome, stopping in the Whispering Gallery and the Stone Gallery on our way to the Golden Gallery—a total of 528 steps! The view is well worth the climb, but make sure you are in good shape as there is no elevator to get you up or down. We ate lunch in the Crypt Cafe (good food, reasonably priced) before doing some souvenir shopping in the gift shop, also located in the crypt. When we left St. Paul’s, we hopped on the Open-Top Bus for a guided tour of the city (live guide). [I had pre-purchased those tickets as well, which may or may not be a good idea since we ended up using only one day of a two-day pass…but it did save time standing in a ticket line.) During the tour we crossed Tower Bridge and London Bridge, and saw a number of other significant historical and cultural landmarks. We got off the bus near Westminster Bridge and crossed over to the Houses of Parliament. We walked around and looked at the enormous building from the outside, stopping to take a few pics with Big Ben, which is actually not the name of the clock (or the tower). From there we went to Westminster Abbey, which we toured; it is extensive and magnificent. We crossed back over Westminster Bridge and walked along the South Bank to the London Eye. I had purchased a fast pass ticket online ahead of time, which moved us along to a certain point, but we still had to stand in line for quite awhile before boarding our capsule. The thirty-minute rotation above London was well worth the money and the wait; the view was fantastic! [The capsule was fairly crowded, but not as bad as I feared it might be.] No trip to London is complete without a visit to Harrod’s, so we penciled that in as our last stop of the day. We took the Tube to Knightsbridge and walked from there to Harrod’s, which was a little confusing despite our map and mapping app. We eventually located the store right at dusk, but were disappointed to discover the restaurant we hoped to eat at was not open. Nor was our second choice, and our third choice was about to close. After a quick sprint through the store, we ended up at The Tea Room where we were served a tolerable meal by a less-than-attentive waitress who was more concerned with closing than with serving us dessert. But, that is another story… We took our last journey on the Tube back to our hotel where we packed and fell into bed, quite worn out but happy. Of course, there is MUCH more than this to see and do in London—palaces, parks, museums, galleries, libraries, cathedrals—but we covered a lot of ground in a little over two days and felt that we got a good overview of the city. We spent three and a half days in England, but chose to devote one full day to touring Bath, which I do not regret at all! I highly recommend purchasing Rick Steve’s Pocket London as it includes tons of information, recommendations, and traveler tips as well as a foldout map and several walking tours. His accompanying podcasts are great as well. London is an exciting place to visit and, with careful planning, you can see a lot of it in a short time. Happy travels! Big Ben…or whatever it’s called! 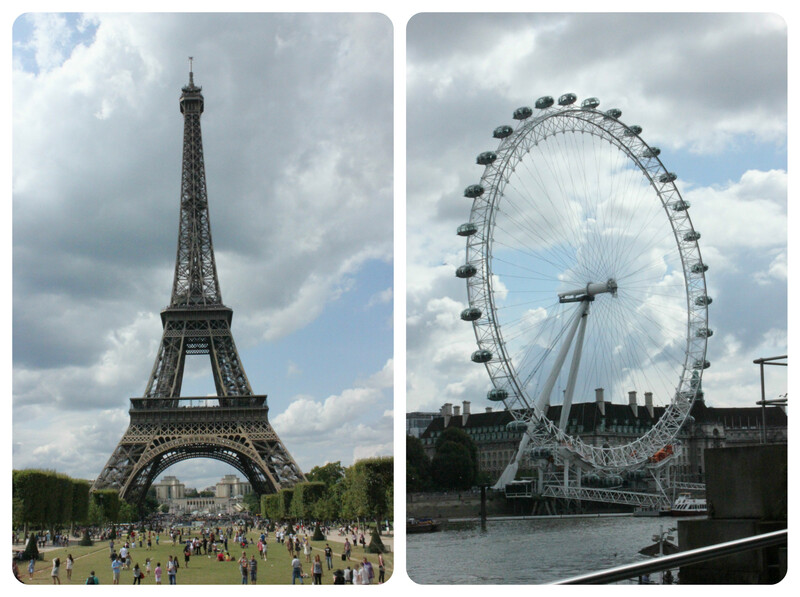 Paris or London…I would be hard pressed to definitively choose a favorite! That is primarily because—in my humble opinion—these two magnificent cities are polar opposites and, as such, make any preference of one over the other completely impossible. I visited Paris first…and immediately fell in love with its vibrance…its beauty…its charm. It was almost like stepping into a movie—or an enthralling book. A little over a week later I traveled to London and—you guessed it—fell in love all over again! Though much more fast-paced than Paris, it retains an old-world, Dickens-esque charm that is offset by the very modern hustle and bustle. So…rather than attempting to choose a “favorite” between two of the most captivating cities in Europe and setting myself up for instant, abysmal failure, I will instead compare a few of the famous landmarks. Both are iconic attractions, instantly recognizable on their respective cityscapes. The Eiffel Tower literally “towers” over most buildings in the world at 1,063 feet tall. The London Eye—though imposing it its own right—seems rather short in comparison at a mere 443 feet high. My pick: The Eiffel Tower…hands down.